This is the first installment of a column from The Bais Yaakov Journal called “From Sister to Sister,” translated from the Yiddish by Sandra Chiritescu. 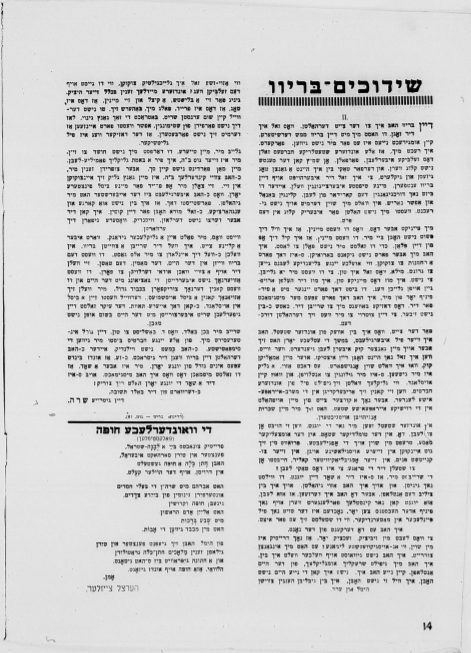 “Shidduch Letters” appeared in issues 78 and 79 of the Bais Yaakov Journal. It purports to be an exchange of letters between “Khane,” a young girl distressed at her father’s attempt to marry her off at what she considers a too-young age, and her slightly older friend, “Sarah,” who indeed had run away from a traditional home (and perhaps arranged marriage), only to become disillusioned with what the secular world had to offer and return to embrace a traditional life. The column reflects many of the realities of the world of its readers, including the defection from Orthodoxy that was in the background of Bais Yaakov and the return to Orthodoxy that was also part of the Bais Yaakov experience. Bais Yaakov was in this sense a “kiruv” movement, attempting to attract girls and women from outside traditional circles and aiming to keep wavering Orthodox girls and women from joining secular movements. The column, despite its almost certainly being fictional, thus faithfully reflects at least some of the shifting religious realities of interwar Poland, and attempts to speak directly to and for young women, without the mediation of the male editorial board (who no doubt screened or perhaps wrote these letters). Although the deep confusion of “Khane” and her reluctance to enter into marriage are ultimately met with a thoughtful, sympathetic, and decidedly Orthodox response, the Journal demonstrated a certain openness to airing girls’ hesitations about the future they were expected to embrace by postponing this response for the space between issues. It was indeed a regular feature of the Journal that such doubts could be expressed, although always within limits, and always with the “proper” response ultimately supplied. In this case, an Orthodox marriage was recommended on the grounds that only such an arrangement could bring true happiness, while the big city only produced empty and temporary pleasures that made young people old before their time. The notion that the (sexual?) freedoms of the city prematurely aged young women stands in some contrast to the way secular Jews sometimes spoke of Orthodox life as turning young boys into stooped old men—most famously, Hayim Nahman Bialik’s Hamatmid [the Talmud student]. 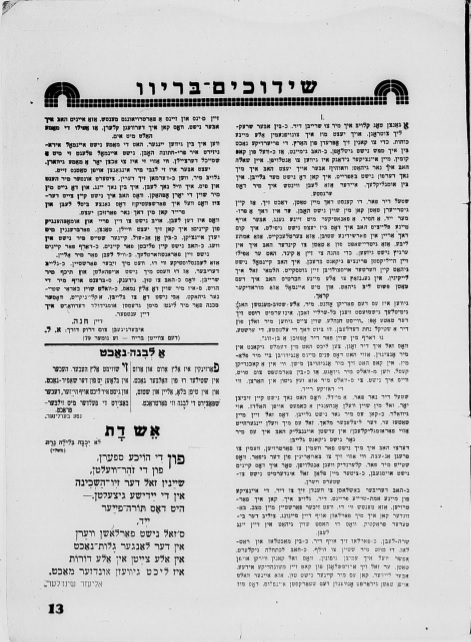 The column must have been a success among readers, because in the years that followed, the Bais Yaakov Journal began to feature a regular advice column called “From Sister to Sister.” “From Sister to Sister” focused on relatively open discussion (compared to the Bais Yaakov discourse of our own day) of life’s difficulties among “sisters,” as young women in the interwar Bais Yaakov and Bnos called each other. I’ve been meaning to write to you all day, but I’ve been incredibly scatterbrained. Even right now I need to gather all my strength in order to get everything off my chest. I didn’t sleep at all last night, I thought I was going crazy. My only desire was to run away from home. I had only one question: Where to? I still haven’t freed myself from that thought; I can no longer stay here, I am unhappy. I’d sooner wish for the worst than for a life like this. Just imagine the following – and you know my father personally after all: I don’t think I could have a more devoted father. He’s a religious Jew, a Hasid, a fanatic with his own ways but until now I didn’t feel that weight on my shoulders. I’ve spent time in other households, but such affection, such true love, such true devotion I have not seen anywhere. In order to raise a child he even broke his holiest principle. I never found the right words to praise his kindness. Why should I deny it? In contrast to all my girlfriends I simply loved my father. And all of a sudden such a terrible fight. What can I tell you, ten candles could’ve been burning inside me, that’s how flaming red my face turned. Everything in my head began to whirl like water in a boiling pot. If someone had told me that I was condemned to death, I don’t know if it would have struck me as deeply as these words. Just imagine, they want to hang a horse collar around the neck of a girl who isn’t even seventeen years old yet. Oy gevald, I can’t believe that my father would say something like that. He who is such a lovely angel should want to make me so unhappy in my young years? At first, I didn’t believe it at all. Moreover, I don’t have anyone to confide in, or to ask for advice about how to avoid the danger that looms ahead. I’m thinking about running away but I must not let anyone know of my plans; I’m worried that otherwise my plan will be destroyed mid-way through. Therefore I decided to turn to you, my only true and faithful friend. I believe that I can trust you. Someone like you will surely understand my situation. I can rely on your opinion, especially because of the bitter experiences you’ve had in your young life. Sarah dear, I’m relying on you. I am powerless and helpless, you must help me. At first, I thought that perhaps I could find someone to change my father’s mind, so that he would give up on his bizarre idea. But unfortunately no one can be of help, someone would have to use their strongest possible influence over my father. It would have to be a confidante of mine and of his but I do not know anyone who fits the bill. What should I think of the fact that even my mother is siding with him? When I was younger my mother more than once spoke of her young marriage ironically; more than once she would tell me with a smile that she became a mother at eighteen. But in regards to my fate she is entirely on my father’s side. Believe me, when I think of the matter my hands and legs are trembling. I still want to live more, I’m still young. But here they come along foreclosing my future years. Why can’t I have more time, what will I be late for? All the little bits of life and joy can only be felt now. What is life, if not to be free and independent of anyone? Now I can choose, dance, spend time with anyone. I don’t have any responsibilities, no one is standing in my way. I don’t have any obligations towards anyone, I don’t have to be responsible for anyone. I want to live for myself. A fun-loving person like you will surely understand me. I also believe you won’t let me wait and will answer right away with advice about what I should do. Remember, I’m in a rush, I’m fed up with everything here; if need be I’d even pick stones, if only I didn’t have to stay here. It’s not just a little something, that danger lying ahead of me! With greatest impatience I await your response. I received your letter in time. What can I say, you really shocked me with your letter. The news wasn’t unexpected, quite the opposite. I assume that all our girlfriends from the shtetl are experiencing the same thing: Doomed. Experience is hard won through pain. That’s why I sat around all day today and pondered whether I should even answer your letter. My deepest convictions will sound banal, maybe even silly, to you before you’ve traversed the corridor of life. I wouldn’t take my opinions seriously either if I were you; you won’t consider me particularly knowledgeable in these matters. I’m pained to think that you will assume I simply don’t want to have you with me. You will think that I’m trying to put you off of your plan so that you shouldn’t become a burden to me. Still, I couldn’t calm myself down, it’s a pity to watch these young, blooming lives go under. Well, what can I do? Whether you will believe me or not, I have to do my duty, I must help you along the right path. You’re four or five years younger than me, I’ve been through a little bit more than you. Therefore I’m moved to write to you even though I am not sure whether your trust in me will persist. Before I left our town I went through a lot; in fact, my entire outlook on life changed in those years too. Who knows, if I still had your outlook of today or my former outlook on things where I would have ended up. It seems I got lucky. I managed to escape. Where to? To a foreign country. How happy would many of our girlfriends be if they could move to Western European countries! But my drunken state began to sober up after a short sojourn in the bustling European cities. In our town we only see the youth as they set out to live. Here in the bustling city among the countless masses you run into those who are spent: You’ll look deeply into their burnt out eyes, at their wrinkled faces, at their washed out complexion and you’ll ask yourself: Is this really life? You tell me that you worry about your youth, that you want to enjoy yourself. I thought like that too, and that’s why I ran away. But here I realized that such life, such youth can only be prolonged artificially, for another five, at best ten years. Death is then even more painful and tormenting than you can imagine right now. I saw it here up close. Why live sixty or seventy years if after thirty you’re already like a squeezed out lemon? I was totally confused. I didn’t know what world I lived in. I felt incredibly unhappy. I ran away from home and didn’t have a new home. Not because I couldn’t have a new home but because I didn’t want one. I was left hanging between heaven and earth. How can I watch without concern as you go down the same path? Our girls are all really hot-headed. A little bit of glitter, a little tickle and they’ll believe it’s day-time, that it’s joy, they’re so easily impressed. Follow my advice, restrain yourself. Meanwhile, don’t take any drastic steps. Examine the situation thoroughly, don’t be fooled by mere moods. Maybe you will recognize that you won’t improve your situation that way, that the path is much more slippery. Believe me, my dear, you don’t need to be suspicious of me, I’m doing very well, thank G-d. I have a happy family life. My husband doesn’t earn too much but we are content. I have two children, thank G-d, my entire happiness is to take care of them. They repay me with joy for those few years I spent in darkness until G-d helped me. You must understand that I am not so stingy or miserly that I should worry about your coming, but I can’t let you come knowing what dangers await you. You know what, I just had an idea! Wait a little a while. I will write you a second letter in which I will invite you to visit me. You will show the letter to your parents and of course they will allow you to visit for two weeks. Like this, you won’t cut your relations to your home and you’ll be able to go back in honor. We’ll also have the opportunity to talk everything through and meanwhile you’ll be spending a little time abroad, I know your wishes. Mainly, don’t take the fatal step of cutting all relations with your home! Write to me as soon as you can and tell me what you decide to do. Your fate concerns me. Of all my young girlfriends you were my favorite. Coincidentally, I thought about you just before getting your letter. I can see that something in the fate of our young years ties us together. I wouldn’t want you to go through the same things I went through. If you worry about your youth, restrain yourself! I’m expecting your answer soon. 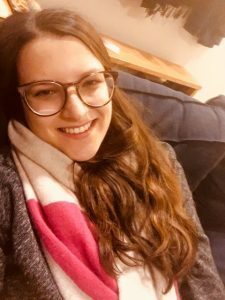 Sandra Chiritescu is a PhD candidate in Yiddish Studies at Columbia University. She is writing her dissertation on Yiddish and second-wave feminism. She has previously translated Yiddish children’s stories for the volume In the Land of Happy Tears (Penguin Random House, 2018). ← Was Bais Yaakov a Feminist Movement?